Preheat oven to 375°F. Line a 17-by-11-inch rimmed cookie sheet with a silicone mat OR coat it with cooking spray and line it with parchment paper. Coat the mat or paper with more cooking spray and set aside. In a medium bowl or bowl of a stand mixer, beat the sugar, eggs and egg whites on high speed until pale and fluffy, about 5 minutes. Stir in vanilla. Add flour mixture in two batches, stirring between, until thoroughly incorporated. Pour batter into prepared cookie sheet and spread evenly with a spatula. Bake about 10 minutes or until cake springs back when lightly touched. While cake bakes, dust a large tea towel with the powdered sugar. Remove cake from oven and carefully invert onto prepared tea towel. 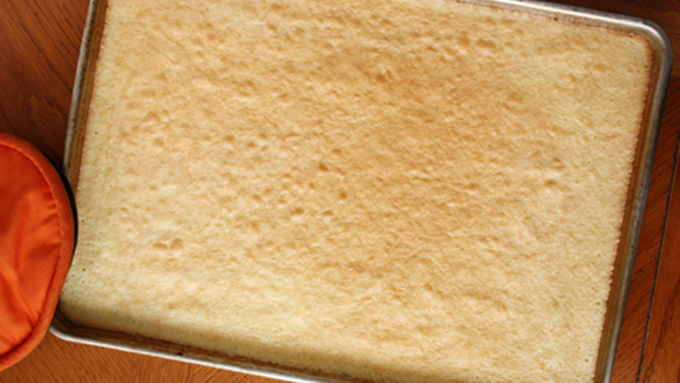 Remove silicone mat or parchment paper and, using a sharp knife, cut cake in half lengthwise. Carefully roll cakes from the long side into the tea towel and place towel, seam side down, on a counter top to cool for 30 minutes to an hour. Meanwhile, make the filling: In a small saucepan combine sugar, flour, egg, water and key lime juice. Cook and stir over medium heat until mixture comes to a boil; stir for 1 minute until thick. Remove from heat; sift through a strainer into a separate bowl and cool to room temperature. When cakes are cool, unroll from the towel and place each cake on a large sheet of plastic wrap. Spread half the filling on top of each cake (you might not use all the filling -- this is OK) and roll up tightly. Cover both cakes with plastic wrap and place in the refrigerator to set for 4 hours or overnight. Remove set cakes from refrigerator and from plastic wrap. Using a serrated knife, cut each cake into 1-inch pieces, like sushi (about 12 slices per cake). 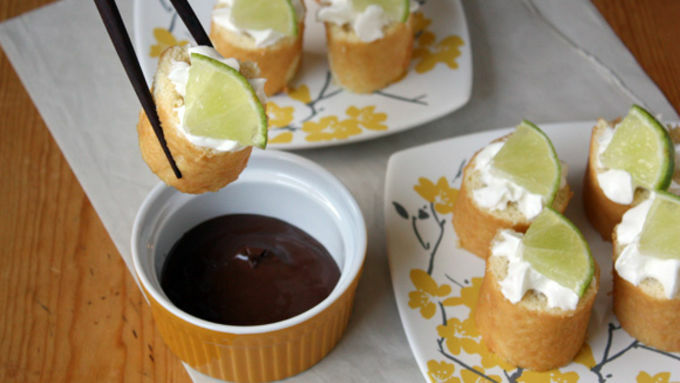 Turn cut-side down and top with a dollop of whipped cream and lime slice. Serve with warm chocolate sauce for dipping, if desired. Ladies and gentlemen, the time has come when you will be introduced to the latest, most amazing phenomenon in culinary history to date: Dessert sushi. You read right. Dessert sushi is the newest, coolest food trend since regular sushi – it looks like sushi but tastes like cake, and it’s fun to make, serve and eat. 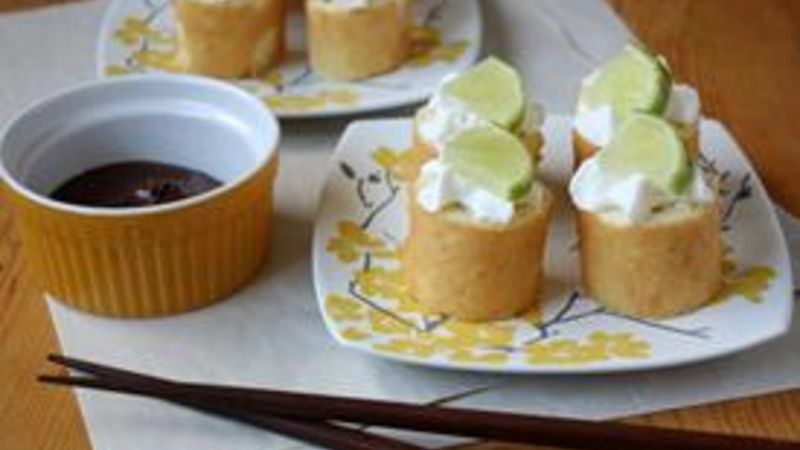 This recipe for Key Lime Dessert Sushi is one great example.When it comes to food, my two favorite things are sushi and dessert. So when I discovered this gastronomic milestone, you better believe I was intrigued. What really sealed the deal was how, unlike regular sushi, dessert sushi is a cinch to make in your own kitchen. All it takes are a handful of simple ingredients and just a few hours (most of which can be spent drooling over impending dessert sushi) and you’ve got the latest and greatest food trend on your home table. Dessert sushi is, in many ways, just like a miniature jelly or cake roll. 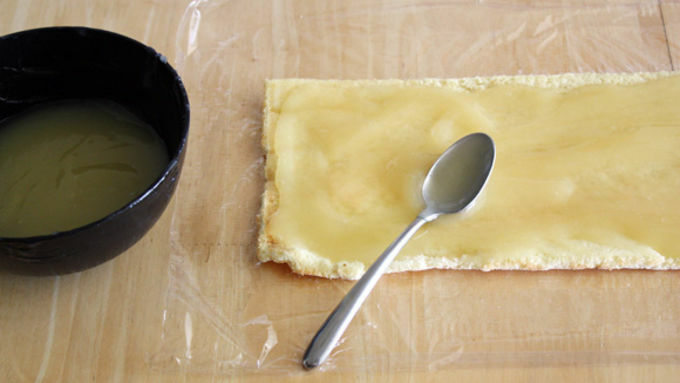 So for those of you who love cake rolls but don’t want to eat a whole slice, this is great way to have your favorite dessert in bite-size form. Plus, their cuteness is pretty hard to resist. This recipe is extremely versatile, too. Not a fan of tangy key limes? Swap the juice with lemon or orange instead. Or, mix things up with lemon filling and blueberries on top, or strawberry jam filling with slices of kiwi on top – there are endless options! Serve it with a side of “soy” sauce (a.k.a., warm chocolate dipping sauce) for extra flavor and fun presentation. Top off your next dinner with the cutting edge in food trends: A little dessert, sushi-style. Check out these super sushi recipes for your next dinner or dessert.